After weeks of commit and persuading user we reached 92% commit but then. 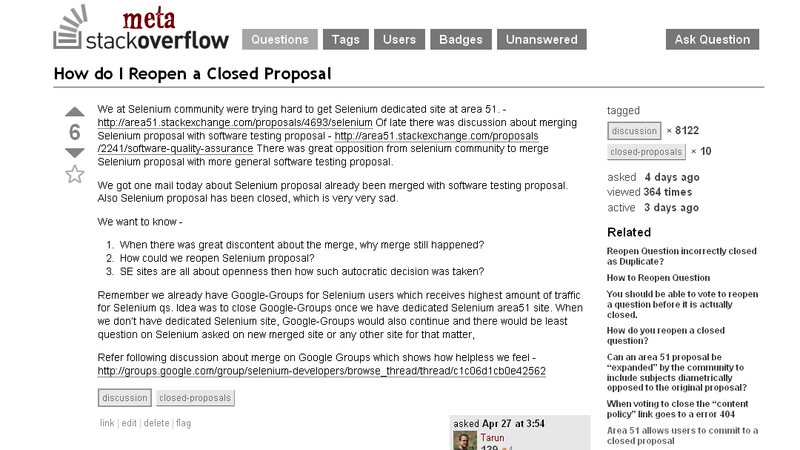 Well Stack Overflow did not like the ides of having a dedicated selenium site and proposed to merge it with another software testing proposal on Stack Exchange, Which was largely looked down upon at by Selenium Community. Though we were ready for browser automation proposal but merging Selenium proposal with a field like software testing was way to general for us to accept, though we were ready to have it collaborated with browser automation kind of proposal. 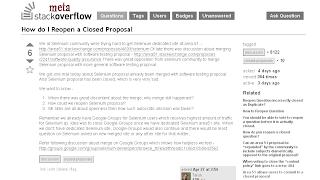 There was great dissent from Selenium users but as ill luck would have it, Stack OverFlow decided to close Selenium proposal and merge it Software Testing proposal. Well, we were not ready to give up easily and filed one question here.